The Hotel Drisco was originally constructed in 1903. Today, the Hotel Drisco blends traditional elegance with the convenience and comfort of a world-class modern hotel. All guests enjoy a gourmet buffet breakfast and an evening wine aperitif. Ideally located in San Francisco’s most celebrated neighborhood, Pacific Heights, the Hotel Drisco puts you close enough to everything while remaining exclusively tucked away in the beauty of a historic residential neighborhood. The prime location provides easy access to Union Square, the Financial District, Fisherman’s Wharf, the Moscone Convention Center, and the San Francisco Bay. Our excellent location and charming accommodations make San Francisco’s Hotel Drisco the ideal venue for intimate corporate meetings and events, accommodating wedding or Bar/Bat Mitzvah groups and hosting trunk shows. The Boardroom has an 18 person capacity. The meeting space is available from 7:00 a.m. to 10:00 p.m.
Our tastefully appointed Deluxe Rooms are ideally suited for today’s business or leisure travelers. 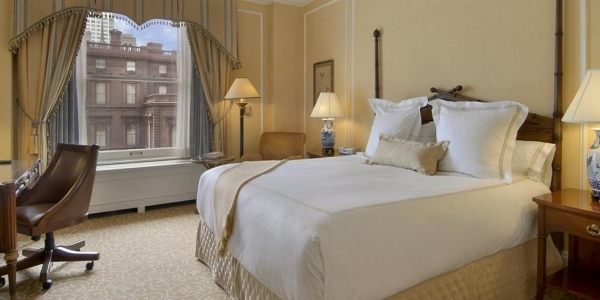 Each room offers one queen bed and a workstation complete with desk and complimentary wireless Internet access. 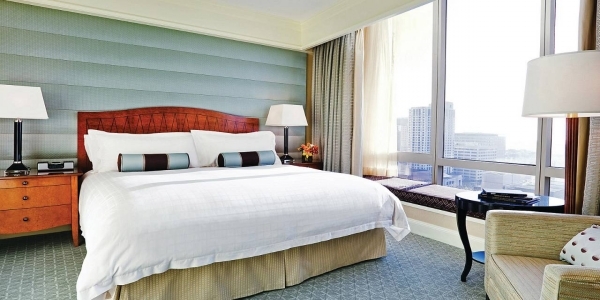 Our tastefully appointed Deluxe Rooms are ideally suited for today’s business or leisure travelers. Each room offers one king bed and a workstation complete with desk and complimentary wireless Internet access. These rooms offer expansive city views of the local neighborhood across to Twin Peaks and to the downtown skyline. Each room offers one king bed and a workstation complete with desk and complimentary wireless Internet access. These suites provide two very spacious rooms, both with 42″ high-def TVs. The bedroom is furnished with one king bed and a handsome work desk. The elegant sitting area features a plush queen pullout sofa bed, a table and chairs, and a comfortable club chair. Extra amenities include fresh fruit replenished daily. With their elegant decor, large bath, and unparalleled views, our City View Suites are perfect for a romantic weekend or any special occasion. This suite includes a bedroom and a separate sitting area, both with 42″ high-def TVs. The elegant sitting area includes a plush queen pullout sofa bed, a table and chairs, and a comfortable club chair. The bedroom features one king bed and a handsome work desk. Extra amenities include fresh fruit replenished daily. Live like a local with these extremely spacious and private accommodations. These superbly furnished rooms take a City View Suite and connect it with a second adjoining bedroom and extra bath. Both rooms have one king bed, and the elegant sitting area includes a plush queen pullout sofa bed. The suite’s hallway can be locked at the main hallway, so our guests virtually feel that they have their own wing in a private residence. It’s the next best thing to having your very own Pac Heights apartment! 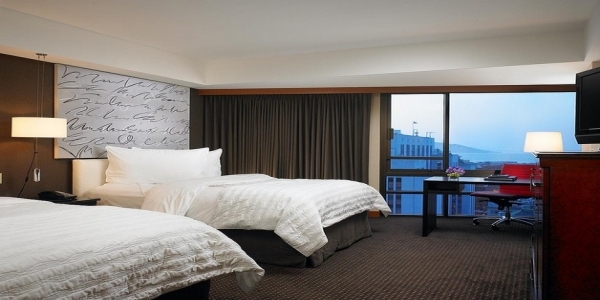 Our tastefully appointed Deluxe Rooms are ideally suited for today’s business or leisure travelers. Each room offers one king bed and a workstation complete with desk and complimentary wireless Internet access. This room has the conveniences and requirements of an ADA-compliant accessible room, including a bathtub and shower with grab bars, a toilet with grab bars, lever fixtures, and an accessible vanity.